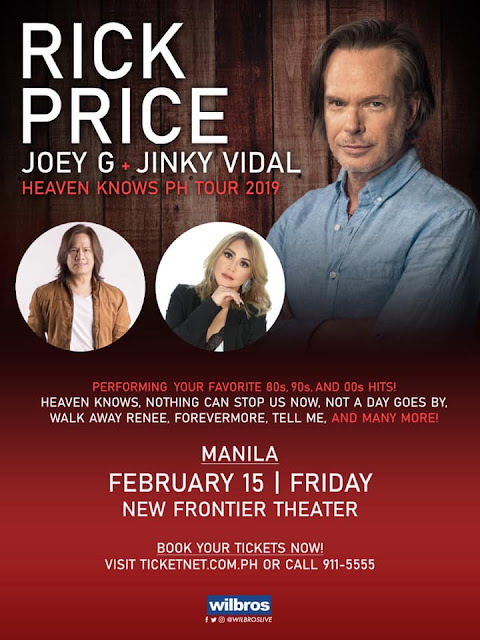 This February, multi-awarded Australian singer-songwriter Rick Price is coming to the Philippines for a Valentine’s show with our very own Joey G and Jinky Vidal – on February 15 at the New Frontier Theater. The ‘Heaven Knows PH Tour 2019 will be focusing on all hits from the 80’s, 90’s and 00’s – a concert you shouldn’t miss this coming Valentine’s season. Rick Price, best known for his massive hit song “Heaven Knows”, has walked the journey many musicians’ dreams are made of. From the very beginning, as a nine year old and the youngest member of his families’ band, music was Rick’s passion. Since those humble yet defining days set amongst the backdrop of country Queensland, the self-taught artist has forged an internationally praised and respected career spanning more than three decades. It was in the 90’s when Rick secured his major recording contract with Sony Records and released his first studio album, Heaven Knows. Rick is also known for other chart-topping hits such as “Nothing Can Stop Us Now”, “Not A Day Goes By”, “Walk Away Renee”, and “Where Is The Love”. Joey Generoso, popularly known as Joey G, is the former lead vocalist of Side A – one of the iconic bands that made a remarkable impact in the local music scene. Filipinos truly loved the songs “Forevermore”, “So Many Questions”, “Got To Believe In Magic”, “Hold On”, and “Set You Free”, which catapulted Joey to the top of fame. Jinky Vidal, the vivacious former lead female vocalist of Freestyle, is still one of the country’s most sought-after singers. May this be Freestyle’s well-loved hits like “Before I Let You Go”, “So Slow”, “This Time” and “Bakit Ngayon Ka Lang?”, or simply her lively rendition of today’s current hits, Jinky always performs explosively exciting. Rick Price with Joey G + Jinky Vidal’s Heaven Knows PH Tour is presented by Wilbros Live. Tickets are now on sale via TicketNet.com.ph or call 911-5555 for more details. We're a concert and music blog founded by Christian Melanie Lee in 2014. A year later, she decided to form a group of talented contributors and photographers who took a sneak peek on what's happening in the concert scene in Manila. The team shared our insights by blogging about music reviews, concert experiences, and music news that every audiophile wants to read on. What happened during the 2 days of Rakrakan Festival 2019?